Sci Rep, 2016, 6:24589. Mubritinib (TAK 165) purchased from Selleck. The cells were treated with either brusatol (40 nM) or mubritinib (8 nM) alone and in combination for 2 h followed by treatment with increasing concentrations of oxaliplatin for 72 h. The differential impacts of Nrf2 and Her2 inhibition (A and B) in the survival rate of SW480/Res cells have been shown. Biomed Pharmacother, 2018, 103:755-766. Mubritinib (TAK 165) purchased from Selleck. 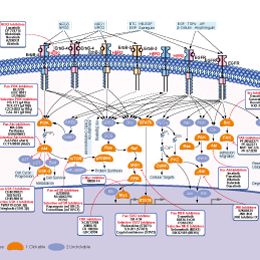 (A) Cell proliferationanalysis of NB4 cells 24 h post-Mubritinib treatments(0–1 uM) as measured by MTT proliferation assay. (B) Representative images of cell cycle progression analysis of NB4 cells 24 h post 0.25 uM and 0.5 uM Mubritinib Treatment measured by BrdU ﬂow cytometry. Leuk Res 2014 38(3), 402-10. Mubritinib (TAK 165) purchased from Selleck. BT-474 cells are seeded on 24-well plates and cultured overnight. 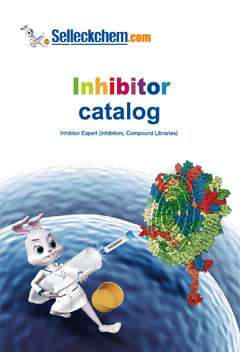 Mubritinib is then added at various concentrations. After incubation for 2 hours, the cells are harvested directly into sodium dodecyl sulfate (SDS)-sample buffer (200 μL). Aliquots containing equal amounts of total cell extract are run on 7.5% to 15% gradient SDS–polyacrylamide gel electrophoresis (PAGE). Following electrophoresis, proteins are transferred onto a polyvinylidene fluoride (PVDF) membrane, for western blot analysis using a relevant primary antibody. Detection of protein is accomplished by an enhanced chemiluminescent (ECL) detection method. The extent of tyrosine phosphorylation of HER2/erbB2 is measured by the LAS-1000 plus lumino-image analyser. The concentration of Mubritinib that inhibits HER2/erbB2 phosphorylation by 50% (IC50) is calculated from a dose–response curve generated by least-squares linear regression of the response using SAS software. Method: Cells are seeded into 6-well plates and cultured overnight. Mubritinib is then added at various concentrations, and the cells are treated continuously for 72 hours. After the incubation period, cells are counted for the measurement of antiproliferative activity. Nagasawa J, et al. Int J Urol, 2006, 13(5), 587-592.